If you a beginner, here are a few suggestions I hope will point you in the right direction. Check back periodically—I will be adding items to this article. Click here for some basic information on shopping for a steel guitar. A late '80s Wheel concert with Mike Francis on tenor sax and drummer Dave Sanger. Learning the steel guitar is a labor of love and, incidentally, a lifetime endeavor! Yes, there are some serious technical mountains to climb at first. That's why it has to be a labor of love; you have to want to climb that mountain. 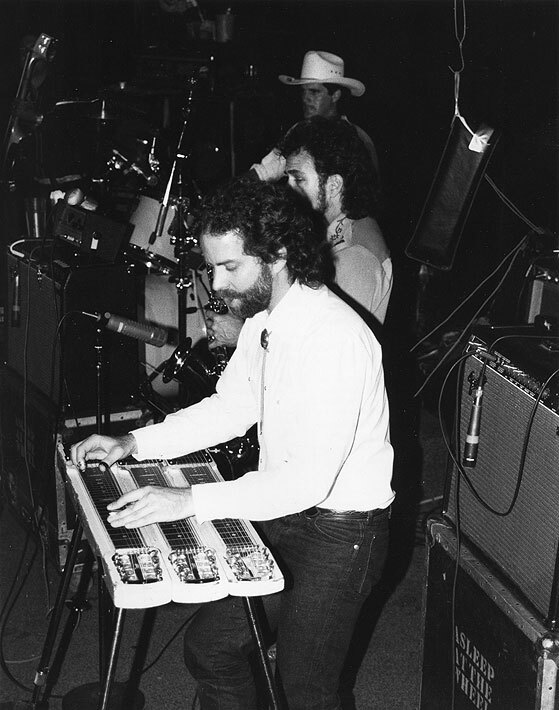 Steel guitar is without a doubt one of the hardest instruments you can take up. But the rewards are great if you can stick to it. You'll have a rare gift that no one can take away from you, as Jerry Byrd used to say. If you have a good ear and innate musical ability, you can be playing local jobs within a year or two IF you apply yourself. And you can do it even quicker if you can find a good teacher. There are a ton of instructional materials available to help you learn, but there's no substitute for a teacher. Unfortunately, teachers are not nearly as common as they used to be. Check the Hawaiian Steel Guitar Association website (www.hsga.org) for a list of teachers. If you're lucky, there'll be one in your area. Remember, there are not many steel players around, comparatively speaking. If you put in the time, you could become an "in demand" commodity in a relatively short time. But there's no getting around the fact that you have to do some serious "woodshedding" to get a handle on basic right and left hand technique. What Kind of Bar Should I Buy? There are many types of bars that have been designed for steel guitar. Most are unusable! I recommend strongly that you purchase a quality "bullet" shaped bar that is 3/4 inch in diameter. The bullet end should be smoothly rounded and the bar should be long enough to cover all of the strings when you place the bar at the 12th fret. For a typical 6-string or 8-string steel guitar, a bar that is 2 ¾ or 2 7/8 inches long should work. You don't want a bar that is too long—for example, one that sticks out more than a half inch when you place it on the 12th fret. A bar that is too thick or too long will be difficult to maneuver properly. If you want to buy a quality bar straight off, I recommend the John Pearse® Thermo-Cryonic™ stainless steel tone bars. They are very durable and have an unbelievably smooth playing surface. Get the 2 7/8-inch Lap Steel/Hawaiian Guitar bar; check the John Pearse Accessories web page for details. What Kind of Picks Should I Use? The use of finger picks is part of the technical hurdle you have to face when you first learn steel guitar. If you've used finger picks before on another instrument, it could be an advantage, although you may have to make some adjustments for steel guitar playing, drastic adjustments in some cases. Don't worry if you haven't used them before. I strongly recommend that you use a plastic thumbpick and quality metal fingerpicks that aren't too thin. 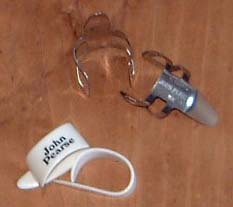 I like the John Pearse® picks; check them out on his Accessories web page. If your local music store carries the Dunlop gauged finger picks or the white plastic National thumb picks, those should work fine also. Thumb picks come in different sizes. Try as many as you can. Picks should fit snugly but should not pinch or dig into your skin. You'll learn to modify the metal fingerpicks so they fit your finger better; you can use needlenose pliers to adjust the tightness and the "wrap" around your fingertip. The tip of the pick should wrap around your fingertip even with or slightly past your finger nail.